In 2007, a group of senior professionals working in autism spectrum conditions (ASC) services, identified a gap in the spectrum of occupational outcomes, in that self-employment was rarely considered as an option, particularly if a greater level of start-up and ongoing support might be required. The impetus for early discussions was the experiences of adults with autism at Number 6 (One Stop Shop for adults with Asperger Syndrome and High Function Autism in Lothians). It soon became apparent that a supported self-employment programme could offer significant opportunity for some people who suffer from ASC (and other people with learning difficulties) to use their skills and talents to run their own business. This could lead to personal fulfilment and greater financial independence for the individuals involved. 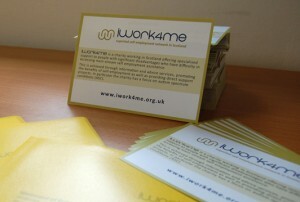 In Scotland, over 1500 people with ASC might be capable of full time self- employment given appropriate support. Although programmes do exist to help people into self-employment, existing provision does not meet the needs of people with ASC. Current programmes typically offer support as far as the start up phase of the business, but nothing beyond that, which could be a critical requirement of a programme aimed at people with ASC. There is a common fear that losing benefits might cause financial hardship, but this can be successfully surmounted. The report recommended setting up a project to deliver this programme of supported self-employment, to include support and training to develop all aspects of a business idea into a viable project, assistance with the start-up of the business and support after the start up. In turn this led to IWORK4ME being established and services going live in 2012. Our Business Coaching service is based in Edinburgh and is accessed by people from all over Scotland.